I've been following Glitter Lambs for a while now on Instagram and besides just being a wonderful person, Jamie makes amazing polishes! As soon as I saw the first swatch of this polish, I knew it would be on my nails one day and today it finally happened! 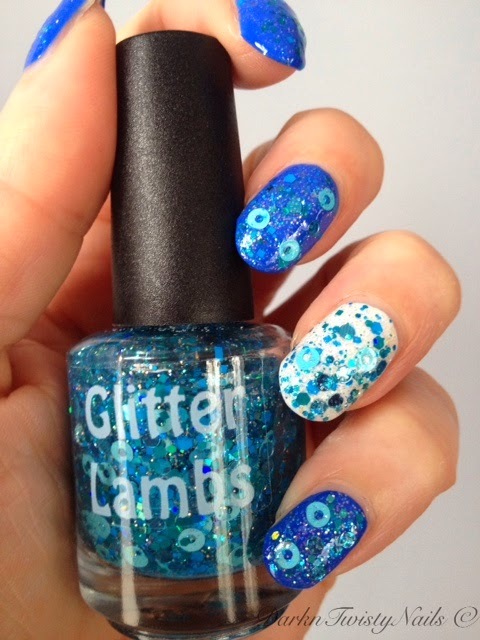 Glitter Lambs Blue Cotton Candy is a glitter topper packed with light blue donut glitter, teal dots, and tiny blue hex glitter in different sizes in a clear base. This is my first polish with donut glitter (round glitter with a hole in the middle) and I love it, it's so unique and fun. The formula was just perfect, all the glitters came out with no effort at all, even the donut glitter behaved like a dream. I did place them a little bit on my nail, just to make sure they were spread out, but I didn't have to fish for them. This polish dried fast, but I would recommend using a good top coat to smooth it out as it does feel a little bumpy because of all the glitter. I used a coat of HK Girl. As my base, I went with a Sally Hansen Pacific Blue and China Glaze Snow as an accent, 2 coats each. I absolutely love this mani. 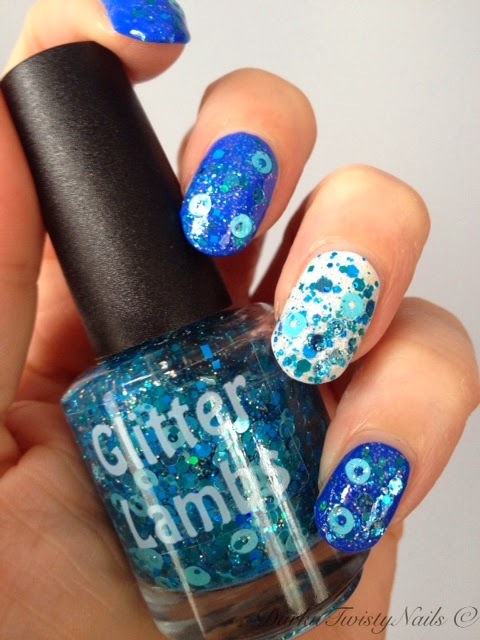 The donut glitter really is unique and I think this polish goes really well with the intense color of Pacific Blue. 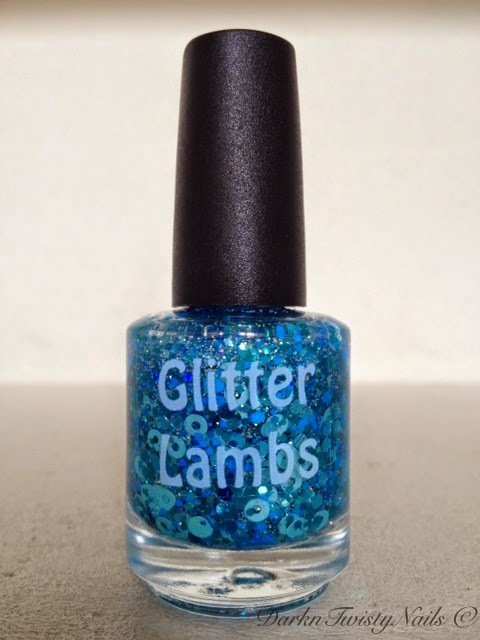 Are you familiar with Glitter Lambs? If not, I'd suggest you go over to her Etsy site and check her out! 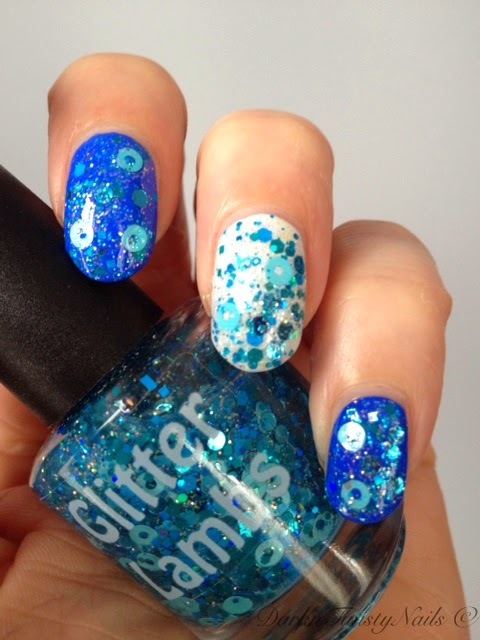 I can't wait to try more of these gorgeous glitter polishes! Ik weet nog steeds niet of ik die donut glitters nou wel of niet leuk vind. De kleuren van de lak vind ik in ieder geval wel erg mooi! Maar je moet er wel van houden inderdaad.